The good news continues: “I am also very pleased to announce that FISA President Denis Oswald has agreed to write a short introduction to the book,” Peter writes. Read more on Peter’s website. My warmest congratulations to Peter for landing such a distinguish publisher! 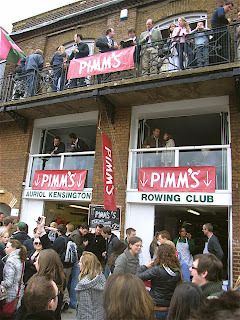 Before and on Boat Race Day Hélène Rémond shot some photographs of London waiting for the race to begin. You can watch her pictures in the slide-show on the right. Thank you, Hélène for sharing them with HTBS. Osisis (Oxford) v Blondie (Cambridge) (heavyweight reserve women). 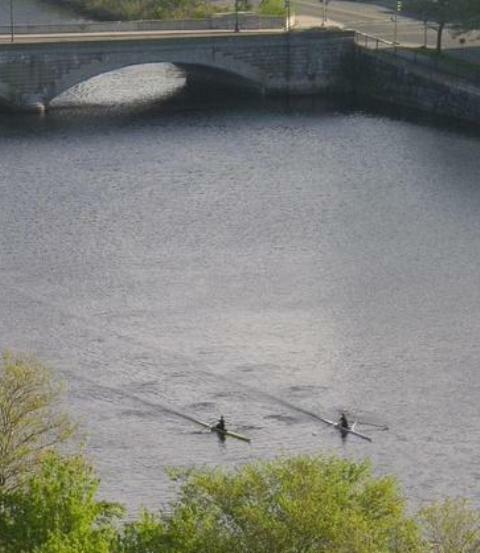 First rowed in 1973, this year Cambridge won on a disqualification. The score is now Oxford 15, Cambridge 23. Oxford University Womens Lightweight Rowing Club v Cambridge University Womens Boat Club Lightweights. First rowed in 1984, in 2011 Cambridge won by one and a half lengths in 6.43. The score is Oxford 11, Cambridge 16. Oxford University Lightweight Rowing Club v Cambridge University Lightweight Rowing Club (men). 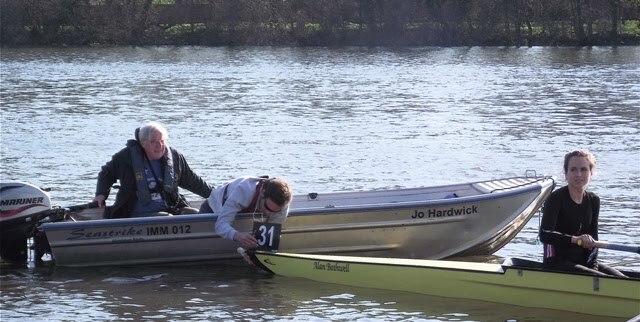 First rowed in 1975, this year Oxford won by a canvas in 5.54. The score is Oxford 16, Cambridge 21. Isis (Oxford) v Goldie (Cambridge) (heavyweight reserve men). First raced in 1965, Oxford won by six lengths in 17.38. The score is Oxford 18, Cambridge 29. Finally, the day before the big one saw Oxford Veterans v Cambridge Veterans (mens heavyweight masters). First raced in 1995, Oxford won by four lengths in 7.24. The score is Oxford 6, Cambridge 10. Thus the total 2011 score is Oxford 5, Cambridge 2. 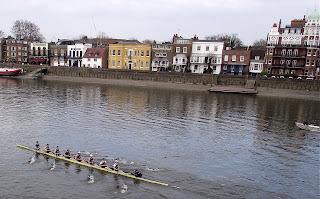 Expressing a personal view, I am surprised that there is not more of a movement to have the Isis / Goldie event on Boat Race Day replaced with the heavyweight women's race currently held at Henley. Why see the second best men when we could see the best women? The reserve men's race cannot even claim that it is an ancient tradition - it only started in 1965. At the time, having the spare men race in preference to the best women would have made sense as female rowing was simply not good enough. Some evidence is of this is here. Nowadays this is clearly not the case and it seems that a great chance to show the world a large part (half?) of our sport is wasted. Do the sponsors not realise the opportunity for even greater exposure that they are missing? They could bring pressure on the organisers to change or, more subtly, offer financial incentives. This would also have the effect of putting much needed money into Oxbridge women's rowing. 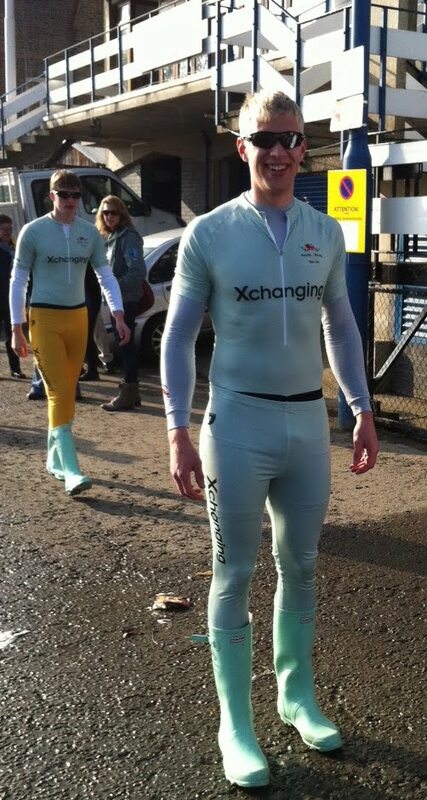 The people in charge of the event clearly have their price as witnessed by their agreeing to call it the 'Xchanging Boat Race' and putting advertising on the racing kit. 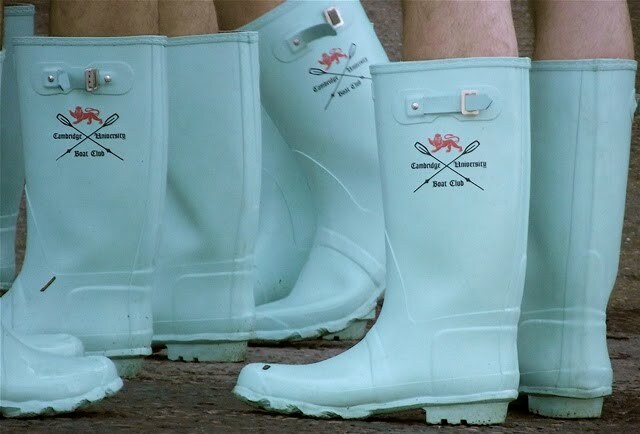 I think that this is enough Oxford-Cambridge rowing for a while on HTBS. Thank you Tim for excellent coverage of this year's Boat Races! 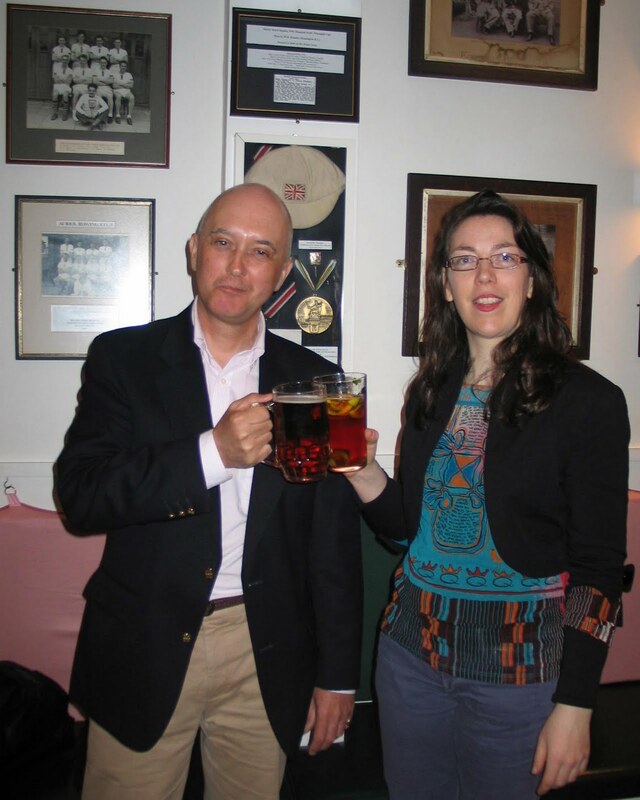 Yesterday, two of HTBS's special correspondents met up at Auriol Kensington RC for The Boat Race and Pimm's, Hélène Rémond and Tim Koch. They are seen in the picture above toasting HTBS and yours truly, which was jolly kind of them, indeed. Tim tells me that they picked a perfect spot for the occasion: by the show case of Wally Kinnear's Olympic gold medal, tie, and cap. For everyone of you who do not know, Kinnear became Olympic Champion in the single scull at the 1912 Olympic Games in Stockholm. Of course, I wish I was there, too, but, alas, I was not. 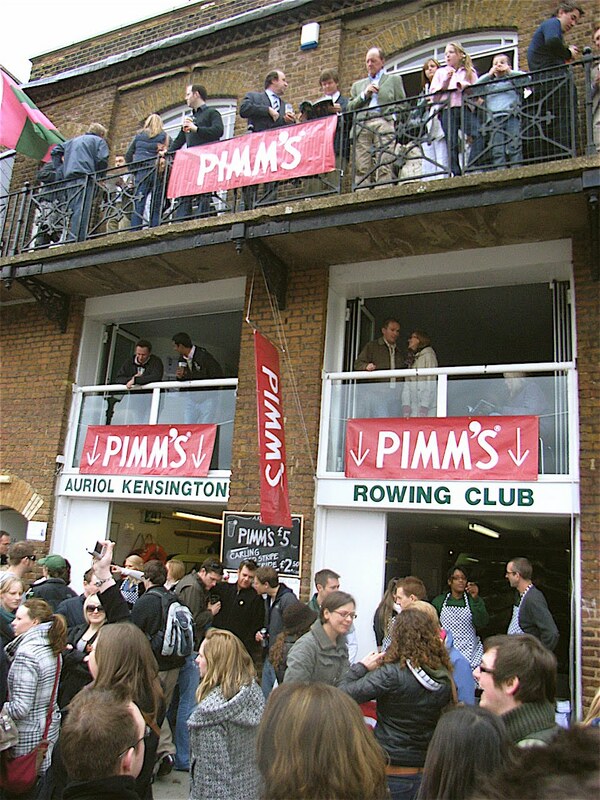 However, to still feel close to these festivities, I did have a glass of Pimm's. I have to be honest and say that it taste much better in England. 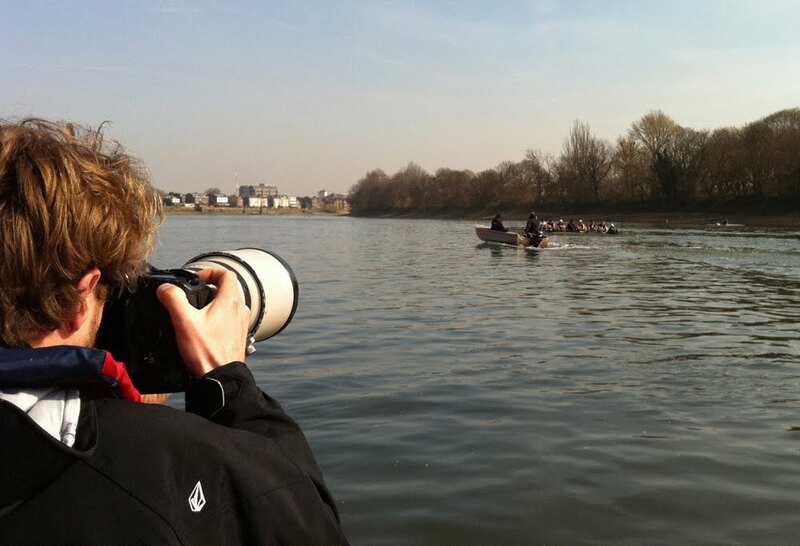 What are the newspapers writing about yesterday's Boat Race? In The Daily Telegraph, Rachel Quarrell writes: "After victories in..."
In The Guardian, Barney Ronay writes: "Oxford won the 157th..."
In The Independent, Paul Newman writes: "Even in a two-horse..."
The London Evening Standard writes: "Oxford produced a storming..."
Oxford, this year's underdogs, won the 157th Boat Race. A full report will follow soon! The daily readers of HTBS have now for a few days enjoyed Martin's and Tim's tales of their adventures closely following the crews from Cambridge and Oxford on the Thames. I am both happy and proud that they are writing and taking photographs for HTBS. Unfortunately, I cannot always manage to get all their nice photographs up on this blog. 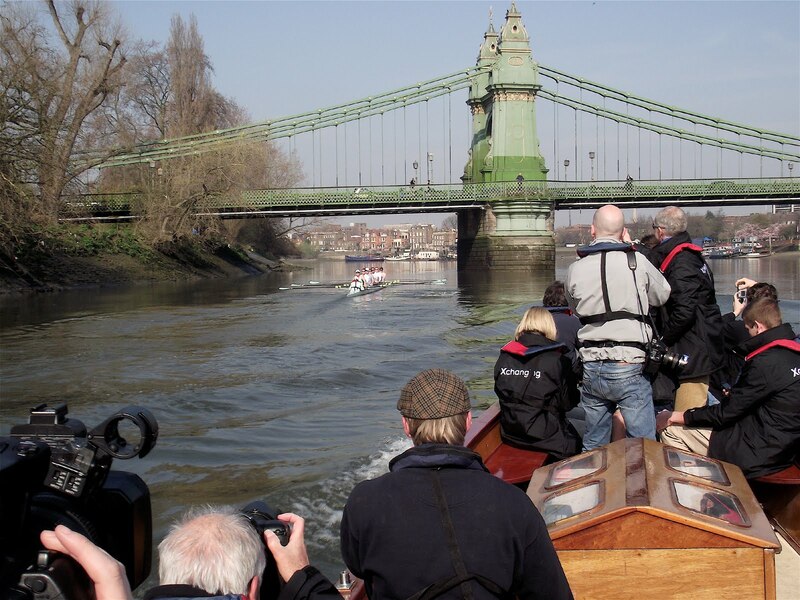 Above you will see one picture showing the hard life of the gentlemen and ladies of the Press at the Hammersmith Bridge (please remember it is not always this sunny and nice when you are out on the launch). 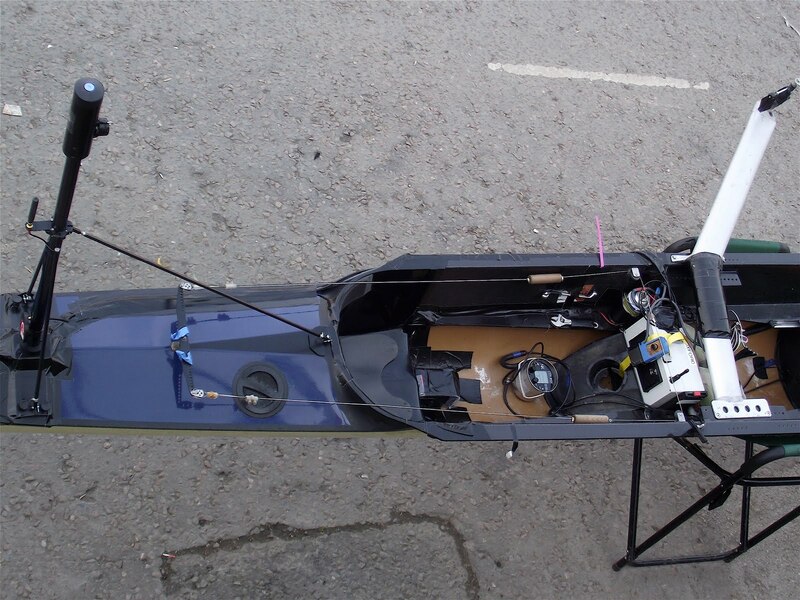 To be able to broadcast The Boat Race to the million of TV viewers around the world, you need high tech equipment in each boat. Here is a photograph that Tim took of the cox-seat. The camera is on the left behind the coxswain. 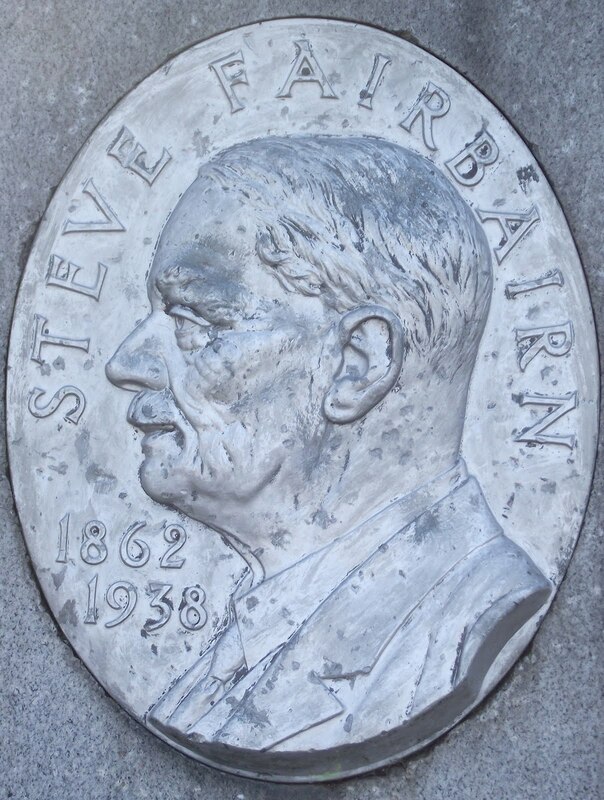 Steve Fairbairn (1862-1938) was an Australian who was responsible for popularising the ‘leg drive’ in British rowing. Sliding seats had been around since the 1870s but traditional British conservatism meant that they were not used to their full advantage and for fifty years after their invention crews in the UK used the stiff ‘orthodox style’ developed for fixed seat rowing where the back does most of the work. 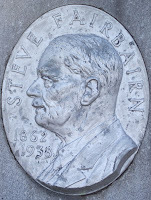 ‘Steve’ was also a great believer in the benefits of rowing long distances and to encourage this he developed the idea of winter time trials, that is ‘head racing’. 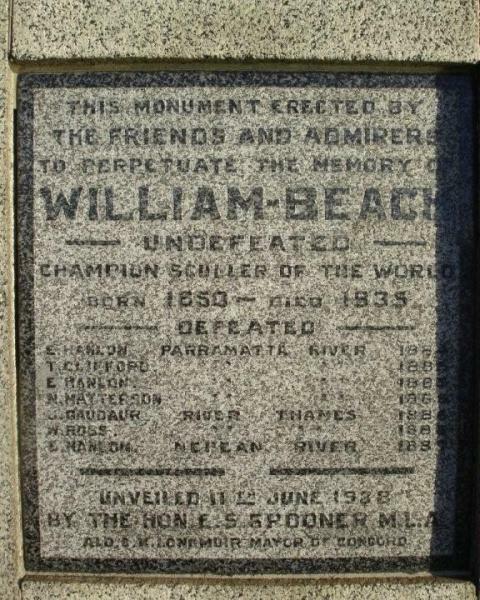 At the time his ideas produced fierce debate (some even holding the idea that ‘It is better to look good than to go fast’) and they were never fully accepted until after the 1939-1945 War. 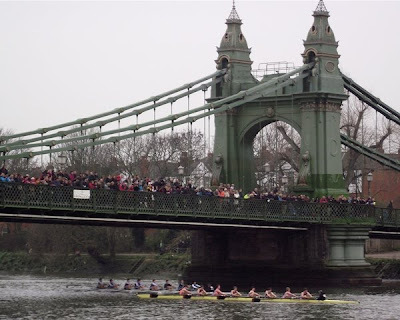 The other official Boat Race timing points are Hammersmith Bridge (record 6:20, CUBC 1998), Chiswick Steps (record 9:56, CUBC 1998), Barnes Bridge (record 13:32, CUBC 1998) and the University Stone at the finish (record 16:19, CUBC 1998). I think that these records will be safe this year. Oxford's veterans Jonny Searle on 7-seat and Matthew Pinsent on 6-seat. 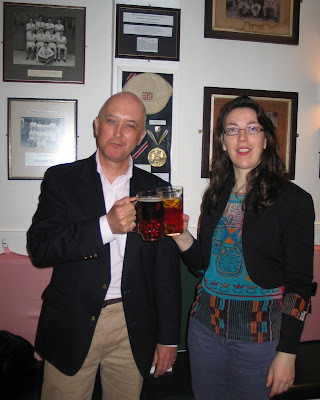 HTBS correspondent: London, Friday 25th March, 2011, 16.30: Oxford has won. 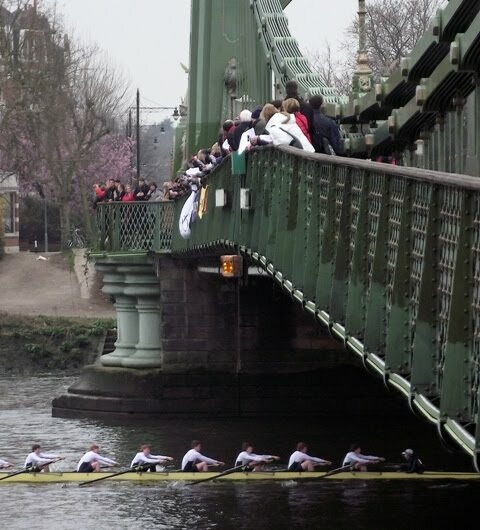 This might surprise you as you may have thought that the Oxford–Cambridge Boat Race was starting 24 hours later. 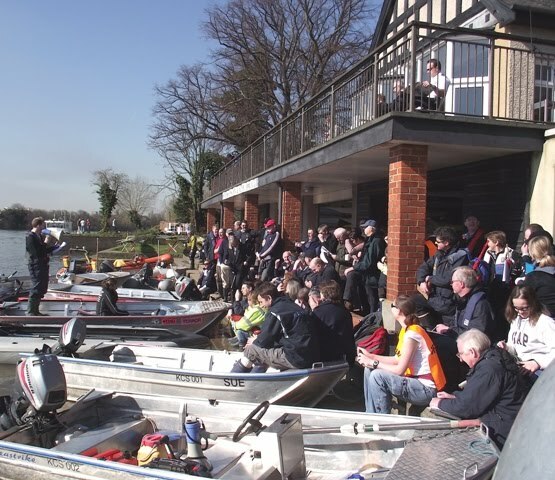 Correct – this was the 16th Oxford–Cambridge Veterans’ (Masters) Boat Race. It is run on a short course, Putney to just beyond Hammersmith Bridge. The rules say that the crews must be selected from full graduates of the University or from full Rowing Blues without that qualification. The average age of the crew must not be less than 42. 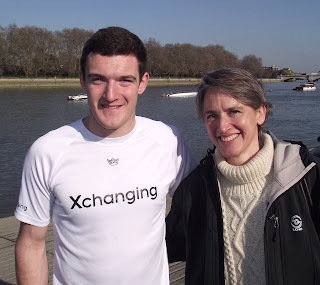 This year, for the first time, two Olympic Gold Medallists took part (Jonny Searle and Matthew Pinsent) though seven of the contestants competed at the Atlanta Games in 1996. Olympians are in bold type. Cambridge: Neil West (Bow), Sean Gorvy, Peter Jacobs, Guy Pooley, Graham Smith, Matt Parish, Richard Smith, Marc Weber (Stroke), Kevin Whyman (Cox). Oxford: Hugh Pelham (Bow), Joe Michels, Kingsley Poole, Daniel Johnson, Matthew Pinsent, Jonny Searle, Rupert Obholzer (Stroke), Martin Watts (Cox). 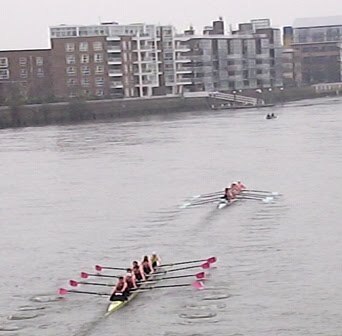 The crews were level until the end of Putney Embankment when Oxford (losers for the last seven races) started to take the lead. Umpire Boris Rankov was kept busy and there was some clashing around the Mile Post (which Oxford reached in 3 minutes 47 seconds). The Dark Blue lead opened out and resulted in a four length victory in 7 minutes 24 seconds. 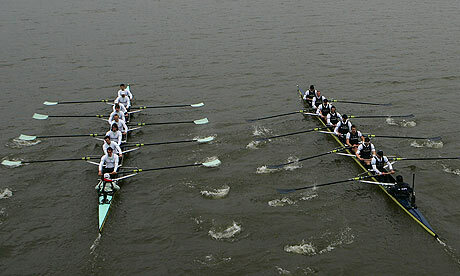 The Cambridge cox appealed over the clash but six times Boat Race winner Rankov held that the Light Blues were at fault. 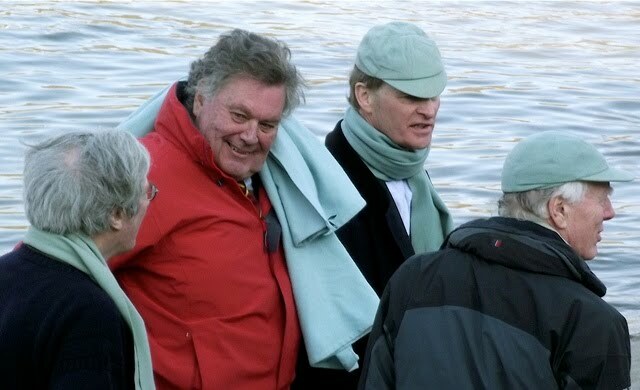 Some would suggest that the coxes’ interpretation of Tideway navigation rules put them both at fault - but that would be churlish. The score now stands at Oxford 6, Cambridge 10. Cambridge passing the Mile Post. Earlier in the day, I had followed the Cambridge morning outing from the Press Launch. 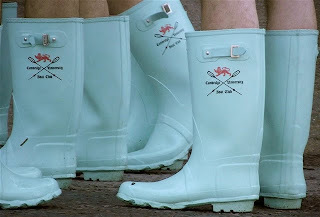 If the Boat Race was a ‘paddling light’ competition, they would be that easy winners. However, the distinguished rowing historian and journalist, Chris Dodd, holds that this is almost always the case (a Cambridge friend once told me that rowing was better at the University because there was nothing else to do). Chris would not predict a result but Patrick Kidd of The Times newspaper says ‘Cambridge in under two lengths’. Perhaps the most predictable thing about race day is that the lovely weather we have been enjoying for the last few days will turn for the worst. 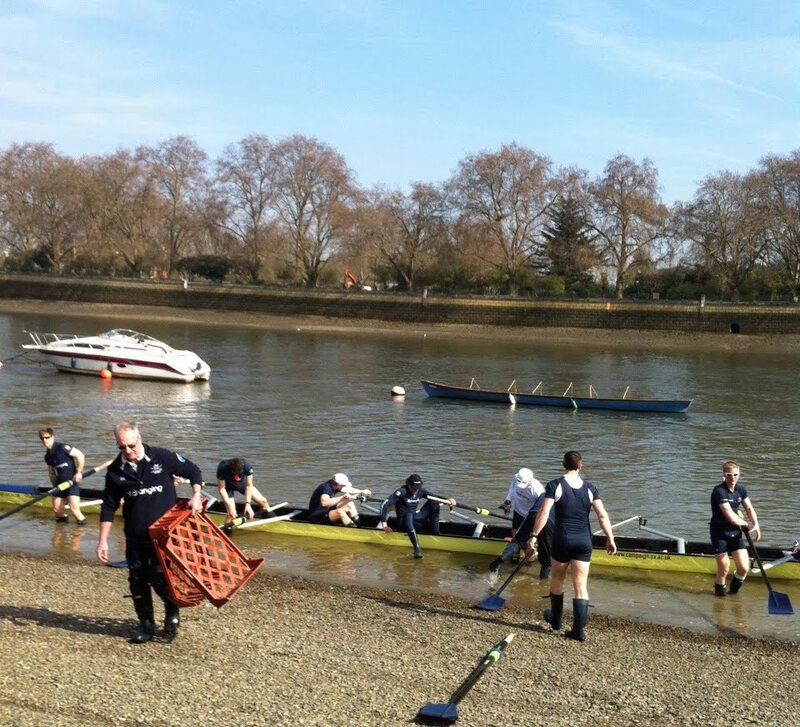 It’s an English tradition even older than the Boat Race. Cambridge's bow Mike Thorp is not hiding a secret but carrying a spare kit. HTBS’s Tim Koch managed to get a brief interview with Alec Dent, OUBC, at Putney. Tim Koch: Tell me about your French heritage. Alec Dent: My Mother is French and my Father is British, I moved to Paris when I was one and lived there until I was ten. I have a large French family and go back there often for holidays. 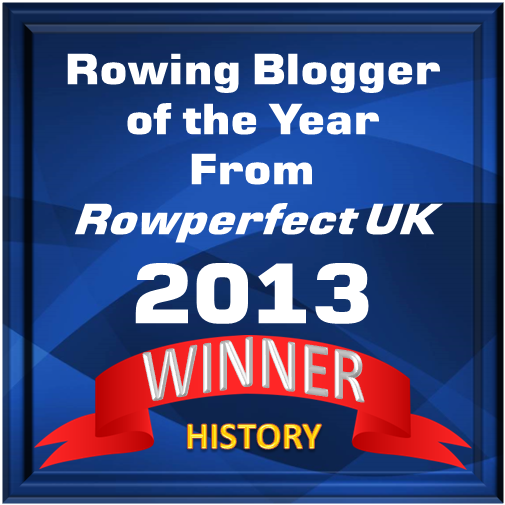 TK: How did your rowing career start? 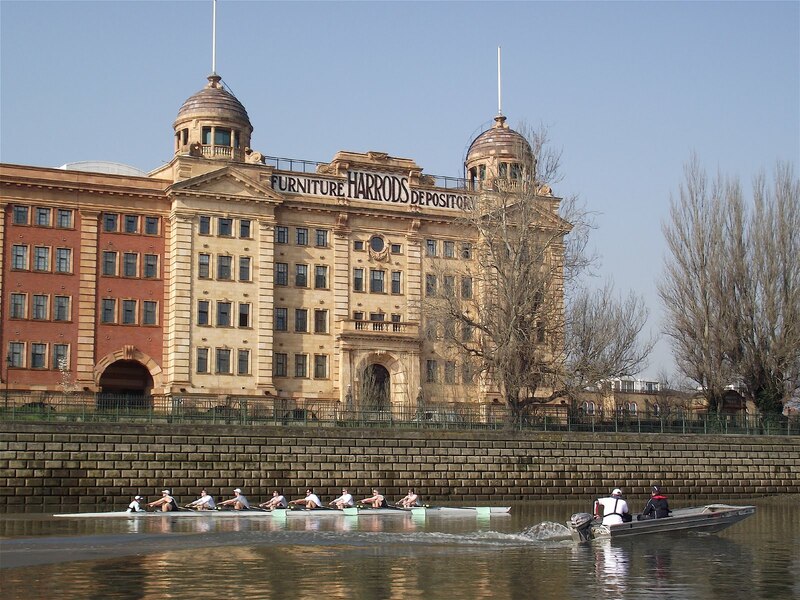 AD: When I was 10 I was at the Dragon School in Oxford where they had a sculling club. 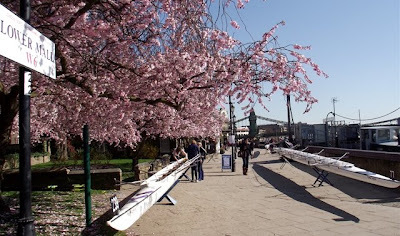 Later I went to Harrow School and they had a very small boat club but it was quite low level so really the only time I have rowed properly is at Oxford in the last three years. TK: You are the elected President of Oxford University Boat Club. Can you explain what this means? TK: You resigned the Presidency for a time. Why was this? TK: Very noble. What qualities do you think you have that got you elected President by the various college boat clubs? AD: (Embarrassed) I think I am seen as determined and always pushing myself (and sometimes that has been detrimental to my performance) .... but also I think I am pretty approachable and am the sort of guy who gets on with everyone in the club, so I feel that I can help bring people together. Alec and his mother, Marie. TK: I asked your mother what 'French qualities' and what 'English qualities' helped get you where you are today. What do you think they might be? AD: I really am a mix of the two.... my French qualities, let me think......? TK: Perhaps I am unfair, perhaps I should say the qualities that you get from your Father and the qualities you get from your Mother....she said that your sporty side was her and your stubbornness was from your father. AD: Father would say 'anything is possible, just go for it', Mother's influence has helped me to get on and make really good friends with people in the club - which helps your performance, you enjoy it a lot more.... The first Frenchman to row in the race was Bastien Ripoll who stroked Oxford in 2006 but my French friends and cousins do not really ‘get it’, it’s a strange concept to them.... the idea of doing sport at school or university is not a priority for most people in France...... but now they will see the Boat Race on TV... they will still think I’m mad, but perhaps they will come to understand that it was worth it. TK: Thank you for the interview. Hear The Boat Sing, HTBS, moves in some fairly distinguished circles these days as we have been given press accreditation for the Oxford-Cambridge Boat Race. On Wednesday 23rd March I went to Thames Rowing Club in Putney, almost opposite the race start, where the ‘Media Centre’ is situated. I felt a little fraudulent mixing with the rowing correspondents of the quality British newspapers but I was more relaxed after a good lunch provided by the PR company. 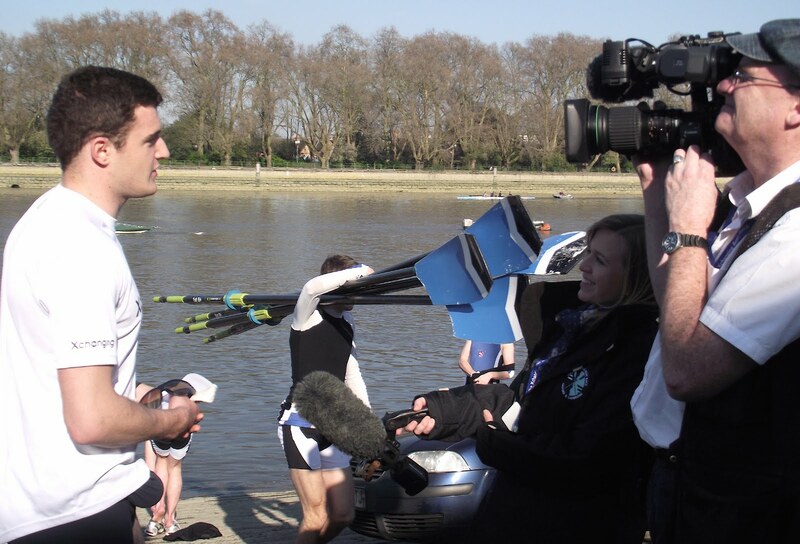 HTBS's Tim in the OUBC launch. The routine in the week leading up to the race is that the crews go out twice a day for a fairly gentle paddle, some sharpening exercises and some starts. By this stage all the hard work is done and nothing too exhausting is undertaken. It is also a chance for guest ‘finishing coaches’ to make final suggestions. All this is done under the watchful eye of the press who follow one of the day’s outings in a launch. Alas, there was no room in the press launch for me but the Oxford launch let me sit in, which was splendid but meant that I only saw the Dark Blues in action. Oxford’s most successful coach, Dan Topolski (on the right) was on board (of the fifteen Boat Races in which he was coach, Oxford won twelve including a run of ten victories between 1976 and 1985). 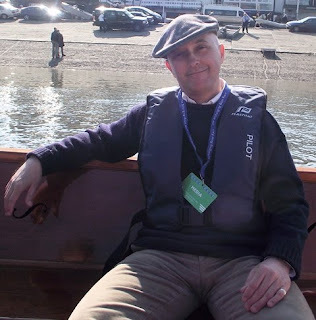 I do not know what Topolski told coach Sean Bowden in the boathouse afterwards but I thought that several of the crew looked a little stiff and tense and that the timing was not always what would be expected of The Blue Boat. At the weigh-in on 7th March, Rachel Quarrell, rowing correspondent of The Daily Telegraph, said that the week before the race may produce a more definite idea of the result on Saturday. I asked her if this was the case: "We saw Cambridge out against Goldie (Cambridge reserves) yesterday (Tuesday)..... they were a lot faster..... Oxford has not done an equal piece that we know of... The reserves look good.... a bit rough on the starts. The Blue Boats have only just started doing starts and pieces. Cambridge looked powerful yesterday but Oxford looked better when paddling. So, at the moment, its any-ones guess who will win." So, as John Snagge said, "...it's either Oxford or Cambridge". 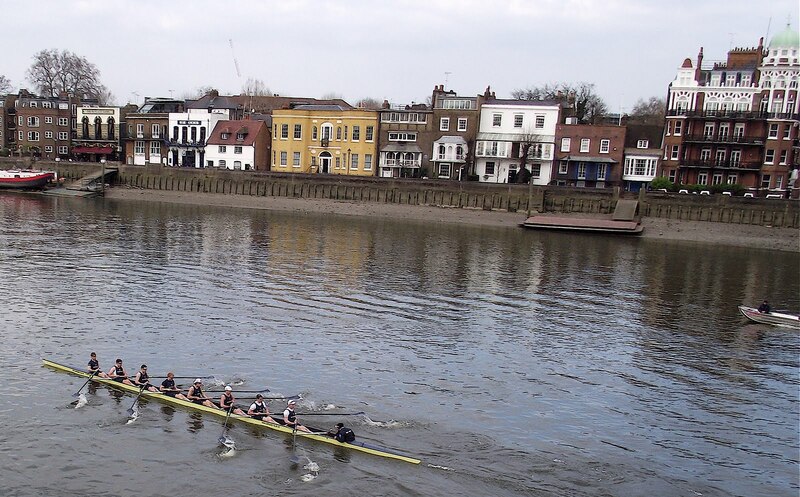 I spent almost 10 hours on the Tideway between Putney and Chiswick today, trying to work out who has the edge for Saturday’s Boat Race. I have little more proof than I had this morning, but my hunch remains. 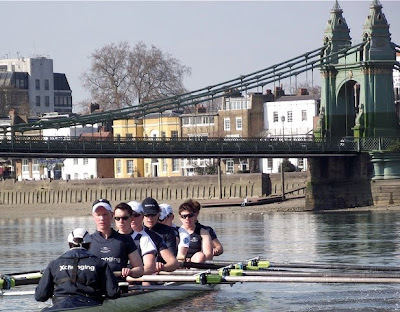 With two days to go, the crews kept their outings light, covering less than half the course in their morning trips out, then practising starts off the stake-boats neat Putney Bridge for the first time on a sunny, clear afternoon with the light easterly wind that is expected on race day. Of the six Tideway Weeks I’ve attended, going back seven years, Cambridge have usually looked better technically and that has not changed this year. Coached now by Steve Trapmore, who stroked a wonderfully drilled Great Britain eight to Olympic gold in Sydney 11 years ago, the light blues are in that mould: sitting tall, balancing beautifully through the second part of the recovery, catching crisply and sending powerfully, although there is a little lugging here and there. Canadian Geoff Roth stands out in the six-seat, while Aussie Hardy Cubasch backs him well from four and there are no surrounding loose ends. 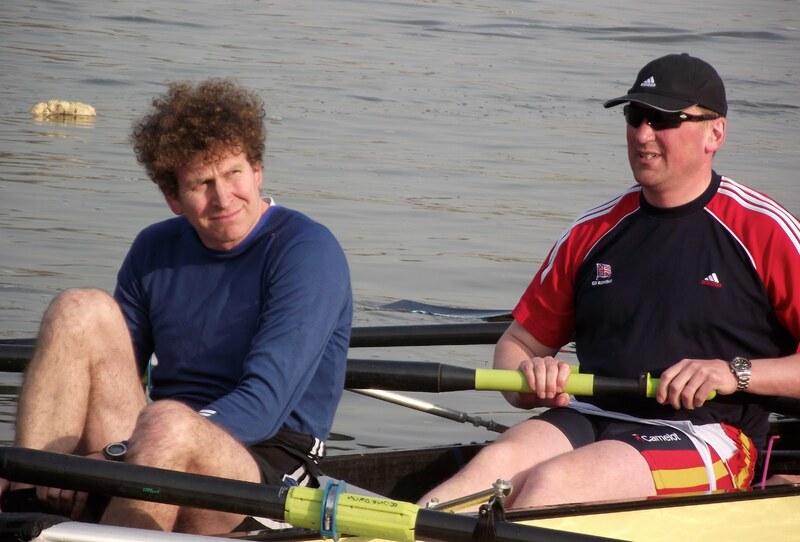 Derek Rasmussen and George Nash, who sit either side of Roth, are fellow Blues – Boat Race veterans. Cambridge lack the lean-back that Trapmore’s predecessors Chris Nilsson and Duncan Holland instilled but they look powerful through that shorter drive phase. Oxford, out on the water an hour later, took over two miles before they were rowing all eight, concentrating on outside-arm exercises rowing in fours and sixes. In contrast to Cambridge, they look scrappy, until the work goes on, at which point it clearly goes on. 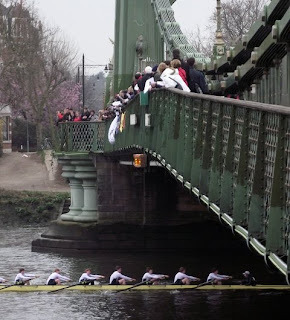 Of the six Boat Races I’ve attended, Oxford have won four in a manner much like this. Oxford’s stern pair may lack international experience but Simon Hislop and George Whittaker are Tideway veterans, having rowed under Trapmore at Putney-based Imperial College, and their experience shows. They are backed by Constantine Louloudis and Karl Huspith – the duo who beat world silver medallists Greg Searle and Tom Broadway in GB pairs trials recently. 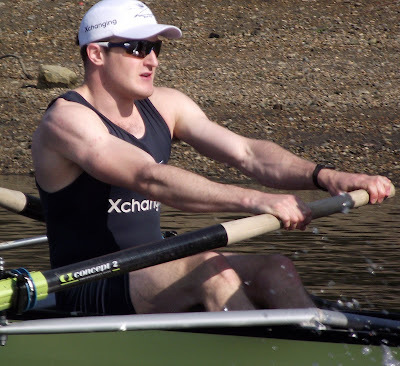 Former Eton College stroke Louloudis looks perfectly at home in the six-seat while Huspith appears awkward with every stroke, although his results prove his style is effective. Huspith and Ben Ellison sit in a dual rig on bow side at four and five – observers reckon this is the first time that arrangement has been used in a Boat Race since Dan Toploski’s winning crew of 1975. 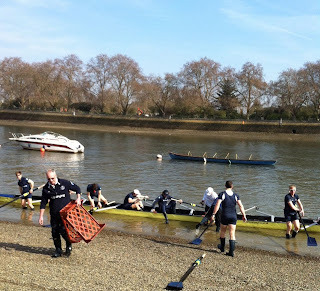 The dark blues put in some powerful but messy practice starts in the morning and I was keen to see whether they would be able to add length later in the day, but I was disappointed as their longest piece in three off the Boat Race start lasted just 30 strokes. Their time over the first 15 was very similar to that of Cambridge – I reckon about a 10th of a second either way, using a manual stopwatch – although Cambridge had found a nice rhythm by stroke 20 while Oxford were still piling along rating 42. Cambridge raced Molesey a fortnight later, with the margins in two pieces apparently pretty similar. One other factor adds to that gut feeling that Oxford will come up short: coach Sean Bowden lacks his usual air, one of confidence that just skirts the borders of arrogance. He could win his 10th race in his 17th attempt – four of which came with Cambridge in the 1990s – but his demeanour at the ceremonial weigh-in (when Oxford were marginally lighter) was not confident. 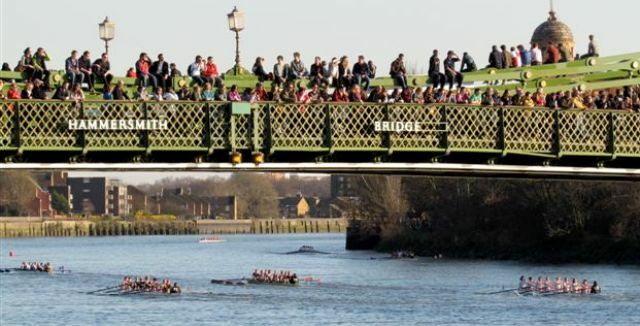 I’ll put my neck on the line: I expect Cambridge to win, making their mark just before that third bridge on the course, either by coming through or opening an unbridgeable gap. By then the crews will have been side by side for around 14 minutes, and it will be the last six months of hard work, rather than this last week of fine-tuning, that will really count. 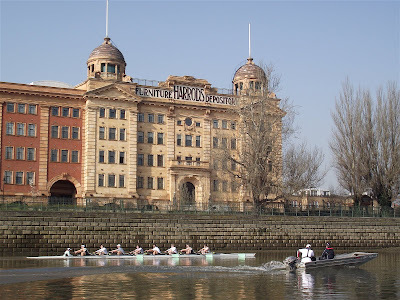 Following the progress of the Oxford-Cambridge Boat Race on 26th March has never been easier for the (alleged) 120 million people who watch the archaic private challenge between two amateur clubs which, in theory, has no place in the modern sporting world. The latest technology has always been used to get the result out as quickly as possible. In late Victorian times it was boasted that the result had reached many corners of the Empire within half an hour thanks to the new telegraph cable. Pathes ambitious multi camera coverage of the 1910 Boat Race (which even includes slow motion shots) shows how the new medium of film was soon used to show the event around the country within days (unfortunately these reels are out of order)! 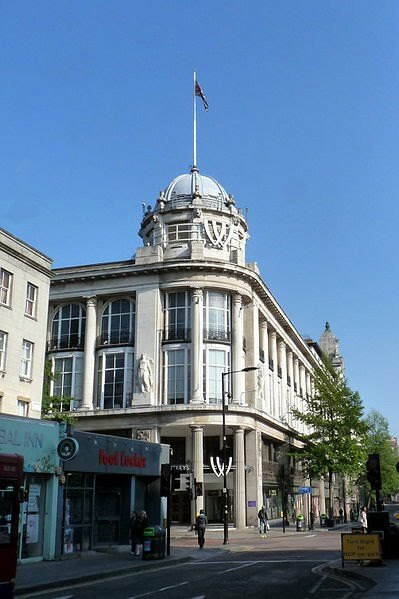 ‘Live’ coverage (arguably) started in the early 1920s when Whiteley’s Department Store in Bayswater, West London, would slowly raise a dark blue and a light blue flag on separate poles to show the respective positions of the two boats through the race. The BBC did the first live radio coverage of the event in 1927 (commentary by G.O. ‘Gully’ Nickalls and the first live television broadcast was in 1938. 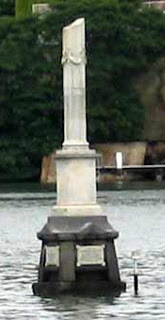 The BBC’s John Snagge commentated on the Boat Race from 1931 until 1980. He was most famous for saying in the foggy 1949 race, “I can’t see who’s in the lead but it’s either Oxford or Cambridge”. He presented the race with an 1829 (the year of the first race) gold coin that is used in the toss to decide stations. UK - BBC1 and BBC1 High Definition will broadcast 15:45 - 17:30 GMT. USA - BBC America 12.30 EST. Worldwide - BBC World News 16:30 - 17:30 GMT. Presidents toss a coin for stations 15:15. Crews start to boat 16:10. Isis - Goldie (the reserve crews) race 16:30. Oxford - Cambridge race 17:00. Thursday 24th - Cambridge 9:30 and 2:30, Oxford 10:00 and 3:00. Friday 25th - Cambridge 9:30 and 3:30, Oxford 10.00 and 3:15. 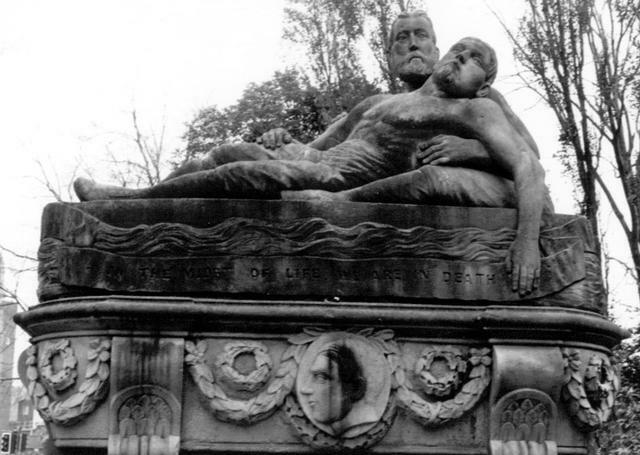 There are some links showing details of Harry Clasper's death and grave/monument. 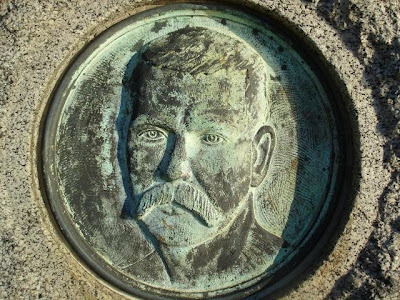 Wikipedia has some external links to Harry Clasper, to go to them click here. "Perhaps you could give me a lead on finding a charming short story that I heard years ago on NPR, but am not able to identify the author or name of the story. I recall that this story is in the first person of an older fellow from Boston sculling on the Charles River. 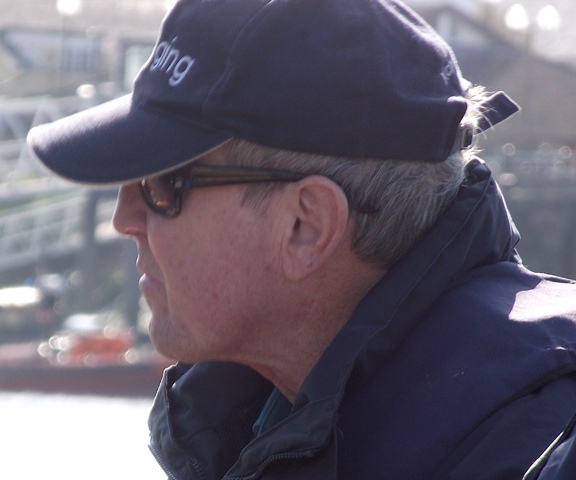 In this story he finds himself sculling against a much younger rower with an attitude. 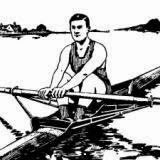 The tale is colored by tradition and wisdom, and I often think about it as I row (especially as I age)." 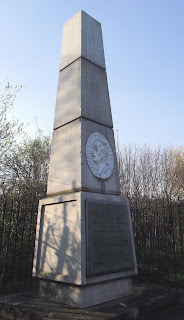 The Schools' Head which, this year, was on 17 March. 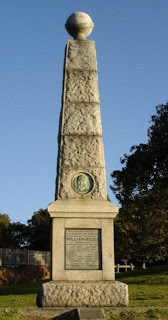 The Women's Head on 19 March. 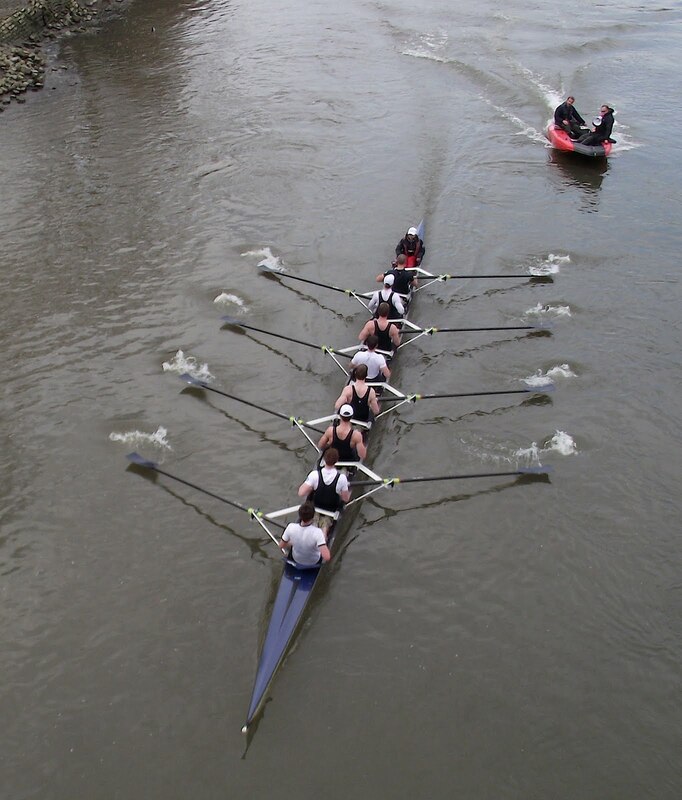 The Eights (Men's) Head on 2 April. The Veterans' (Masters) Head on 3 April. 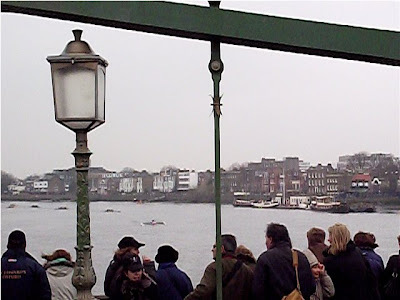 The 'Championship Course' is the 4 mile 374 yard (6,779 metres) Mortlake to Putney course, most famously used in the Oxford-Cambridge Boat Race (but in the other direction). 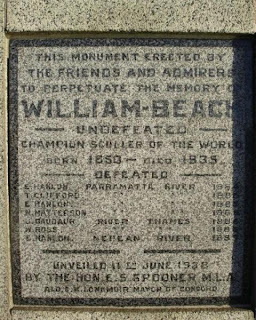 It has been used for boat racing since at least the mid nineteenth century as the 's' shaped course is as fair as one that is not straight can be. 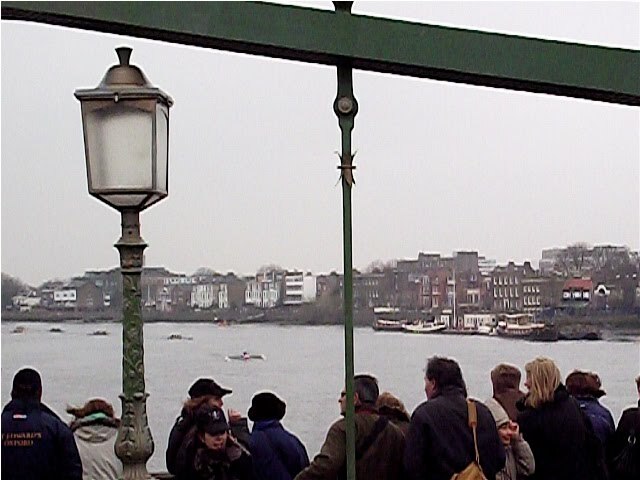 In 1999 the Amateur Rowing Association, ARA (now British Rowing) produced a video, 'Coxing a Tideway Head'. It makes interesting viewing and a lot of effort was put into its production but its random switching between 'safety' and 'steering' makes it difficult to follow if you are not already familiar with this part of the river. The top two positions are a reverse of last year when Eton beat Abingdon. As may be expected, parents turn out to give noisy, partisan and generally uninformed support. It is also a fairly 'social' occasion as most of the schools taking part are private, fee paying institutions. As my pictures show, one of the favourite viewing platforms is Hammersmith Bridge. 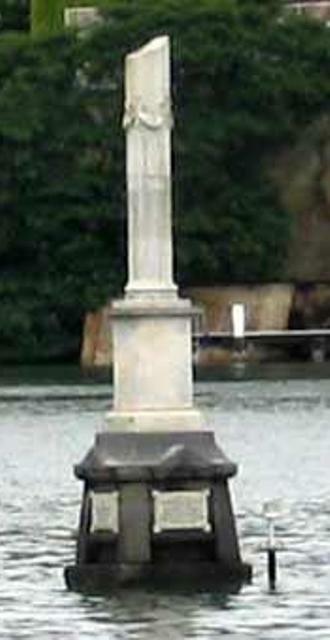 Many people cluster around the famous 'second lamppost from the left of the Surrey buttress' as this is the one point that even the most incompetent coxswain knows that they have to aim for to get the fastest water. Getting ready at Hammersmith for the 76th Women's Head of the River Race. Marshalls' briefing before the start. The Leander crew. Photo: Giles Bedford. The Durham composite (I think they were all Internationals) started at 214 (and so got the slower tide) while Leander went off first (with the fastest water) so there will be much debate on who is really the fastest but it is a strange spread of times for the top crews. It took a long time for the event to become what it is today as can be seen from the short history of the WHoRR on their website. At Hammersmith Bridge. Photo: Claire Waterworth. I was kept busy driving one of the umpires' boats so did not manage to take any pictures during the race, but luckily I could rely on others, like Claire Waterworth and Giles Bedford. Reports from the Men’s Head and Veterans’ Head will follow on 3 April. Great thanks to Tim for the report and to Claire Waterworth and Giles Bedford for allowing their photographs to be posted here on HTBS. "... it was in the 1930s that Fellows found the niche that would shape the lives of dandies for the next 80 years: fashion illustration. 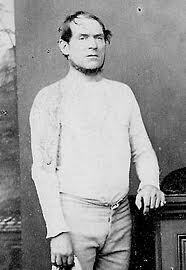 Though he contributed to Vanity Fair, McClure’s, and The American Magazine, among other publications, it was men’s fashion where he was most in demand, and Apparel Arts, aimed at the tailoring trade, and Esquire were his showcases. Fellows ..... could draw fabric, plain and simple. His fabric had weight, heft, drape, texture, and sheen. His flannels, worsteds, tweeds, and linens, his barathea and velvet and twill were all fabulous.